Parties are a great way to socialize and enjoy yourself in the company of your friends. It is also a great means of getting to know your acquaintances better. However, you would also want to make sure that everything flows as smooth as possible. This is where a party agenda enters the picture. 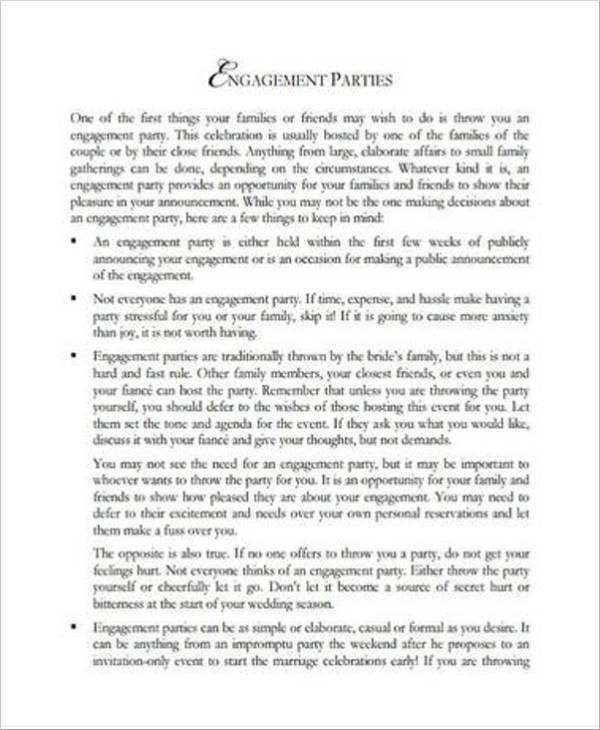 Party agendas are a surefire way of making sure that your party will be organized and you know the sequence of events and activities that you would need to do for the party. 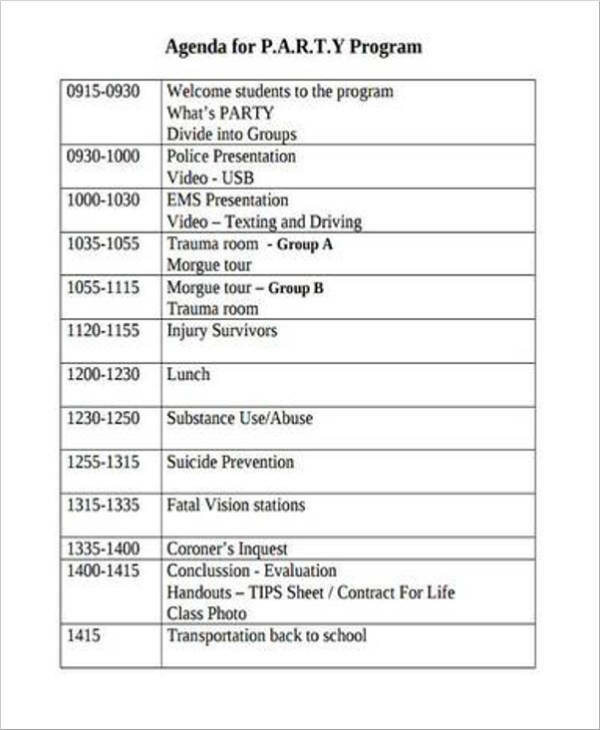 you may also see Event Agenda Samples. 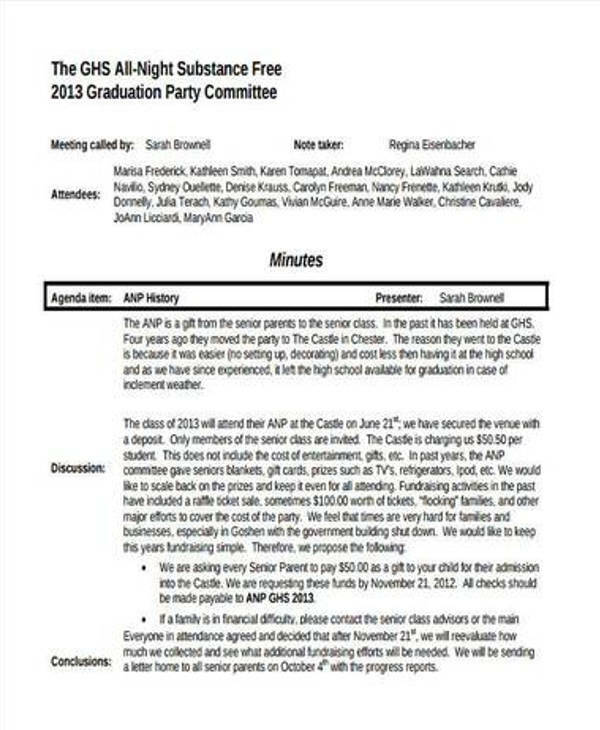 To make sure that you have everything you need to know about party agendas and what to include in these types of agendas, we have shared some useful pieces of information below. 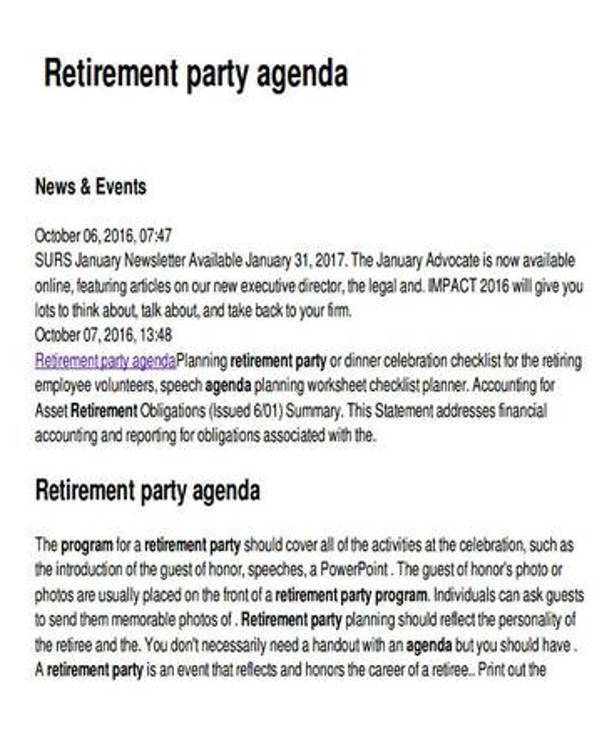 We would also like to share a couple of agenda samples in PDF specific for different kinds of parties—from birthday parties to retirement parties. This way you will have a lot of references, plus you will also be able to find one that will be a great fit for your party needs. 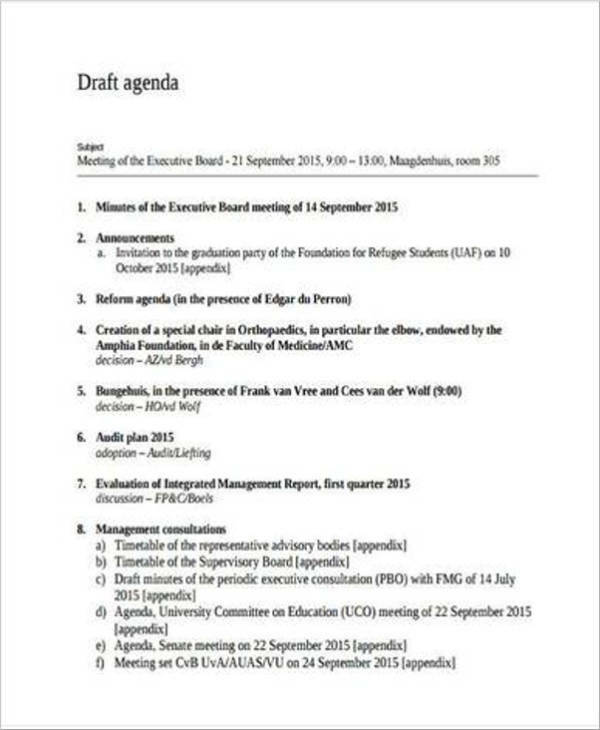 Just make sure that you keep reading and keep scrolling to find out more about party agendas. 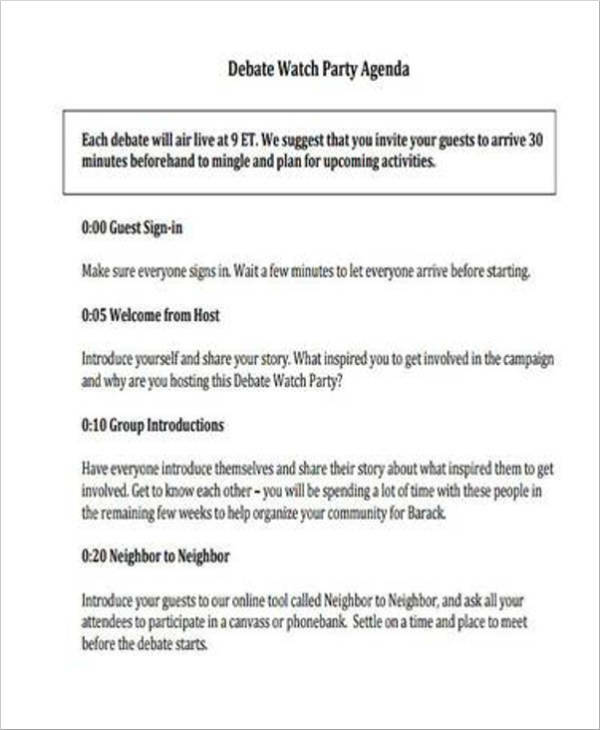 What Is a Party Agenda? 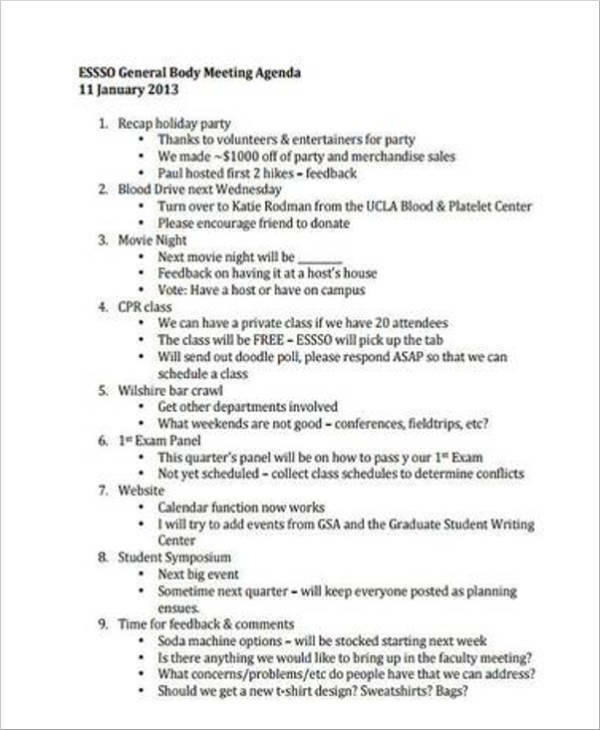 When you want to make sure that your party goes as smooth as possible, you can make use of a party agenda. 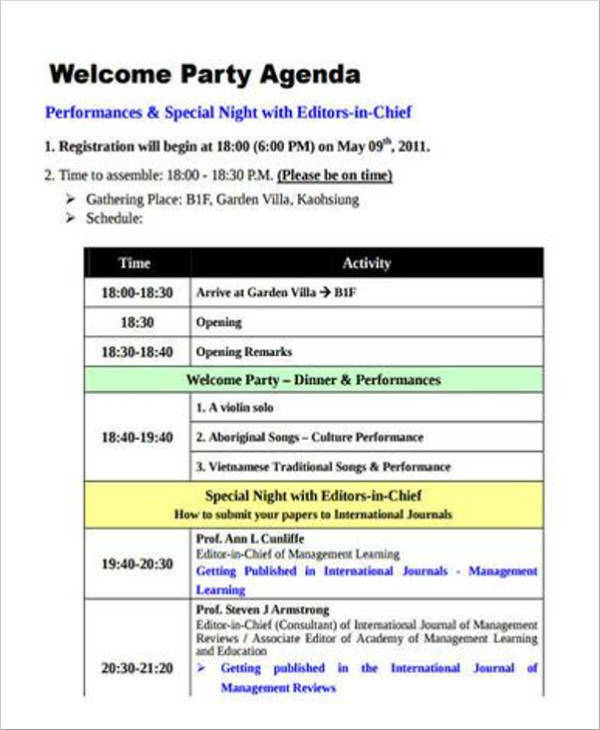 So what is an agenda for a party? 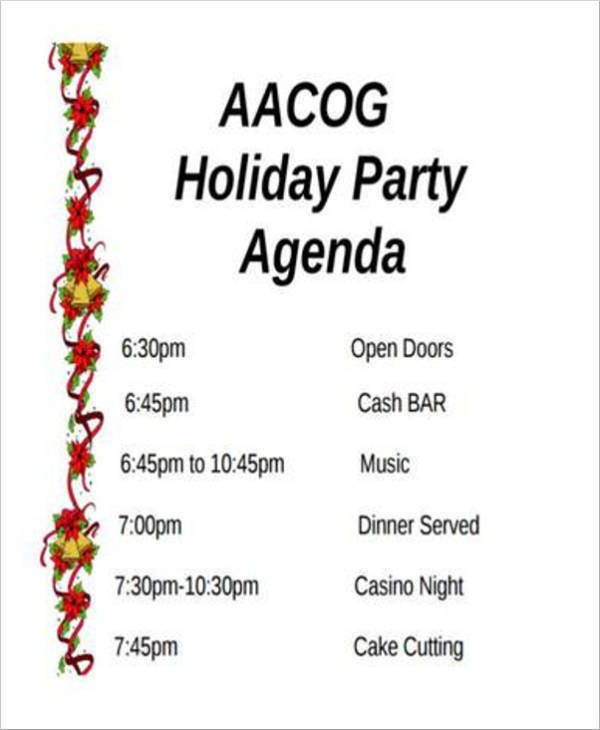 A party agenda is basically a list of the tasks or activities that need to be done before, during, and after a party. The before and after tasks are usually disseminated to the people behind the preparation of the party while the during activities is disseminated to those who are invited to the party. 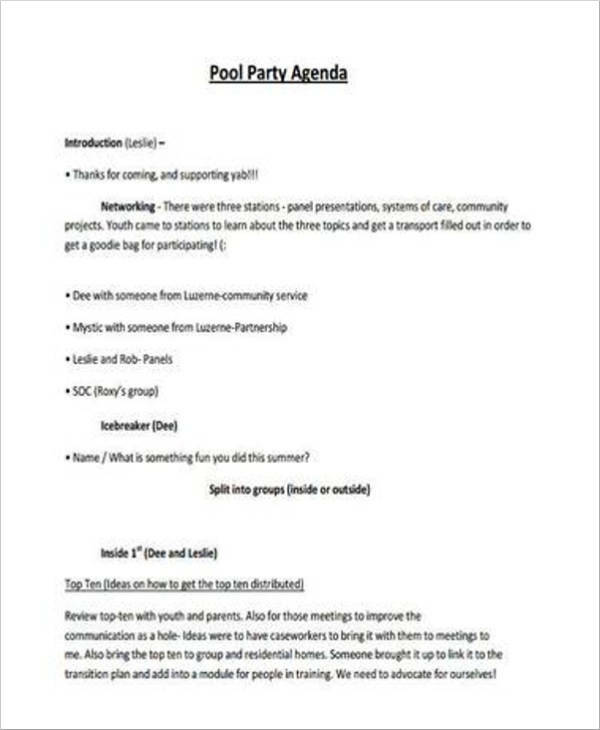 So basically, what this means is that a party agenda is a quick outline of the flow of tasks and activities and a general expectation of what will happen during the party. Why Is a Party Agenda Important? One of the best ways to control your party is by coming up with your very own party agenda as this gives a good outlook on what is going to happen and when events and activities will happen. The main purpose of having a schedule for your party is the fact that it will give your party more sense and more purpose plus, it makes sure that everything will be on track and will be organized. This gives the guests a feeling that everything is well-planned and that you are not just winging it. Your party agenda helps to avoid making your guests feel that they have to wait around for a long time before they get to know what will happen next. 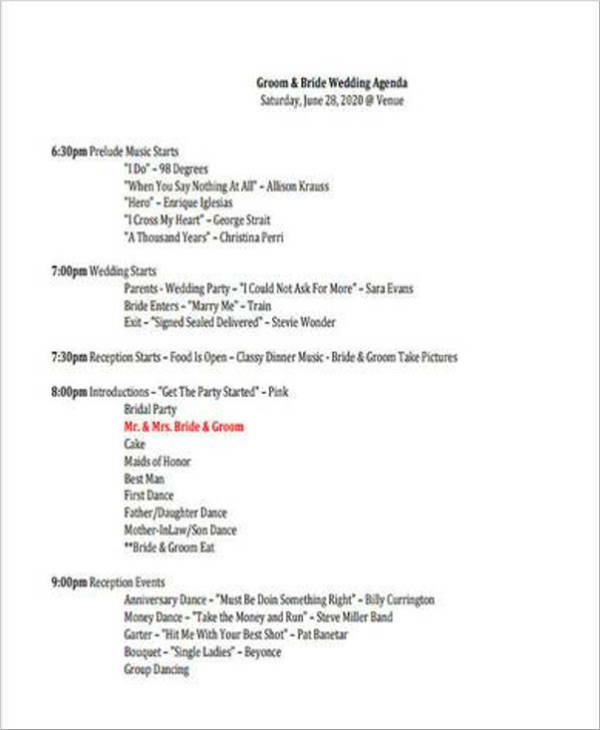 you may also see Wedding Agenda Samples. 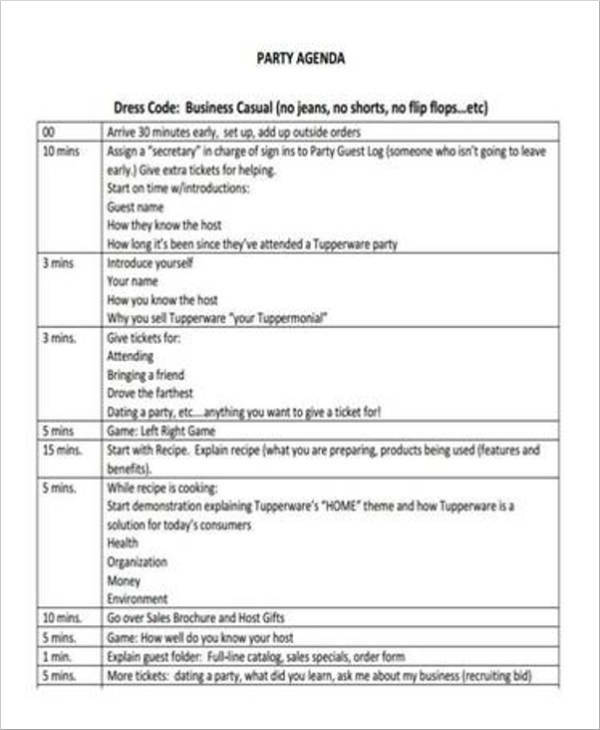 Party agendas may seem easy but it is actually not as easy as you think it is. It is a bit trickier than it seems. Why? Sticking to a schedule is a bit of a challenge especially when you have an event planning team with you. You want to make sure that everyone is on track and is sticking to the schedule that you have. Your party agenda will help to make your party flow properly from the moment the activities start to the moment that you arrive at the last activity of the party. Some of the sample schedules that you can follow for your own agenda will be listed below. 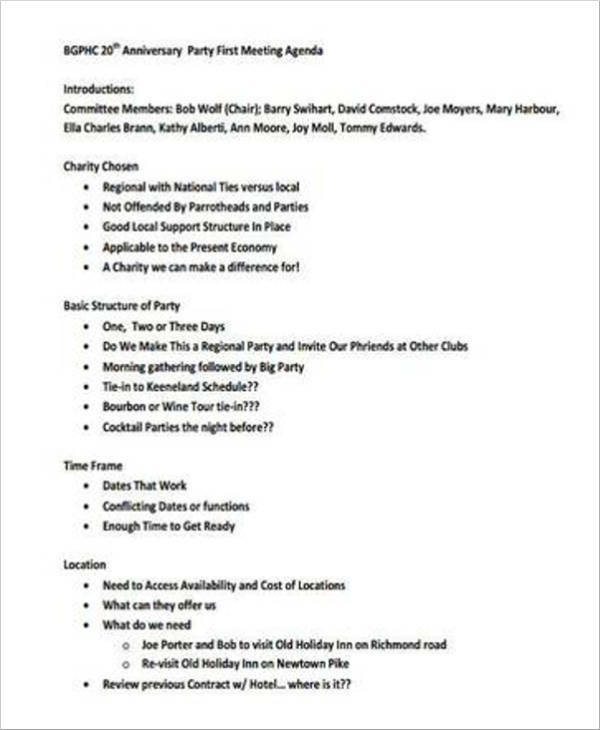 This will help to give you an idea of what you can include in a party agenda. 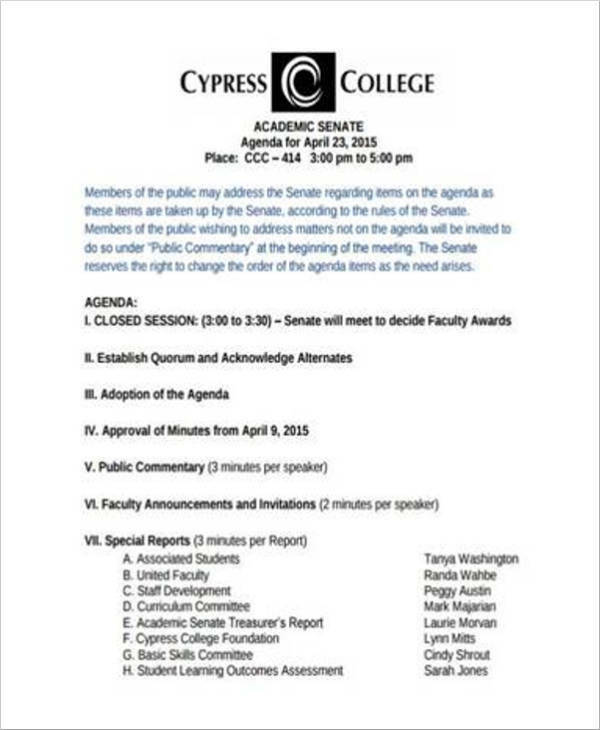 6:30 PM to 8:00 PM – Intermission numbers, speeches, etc. 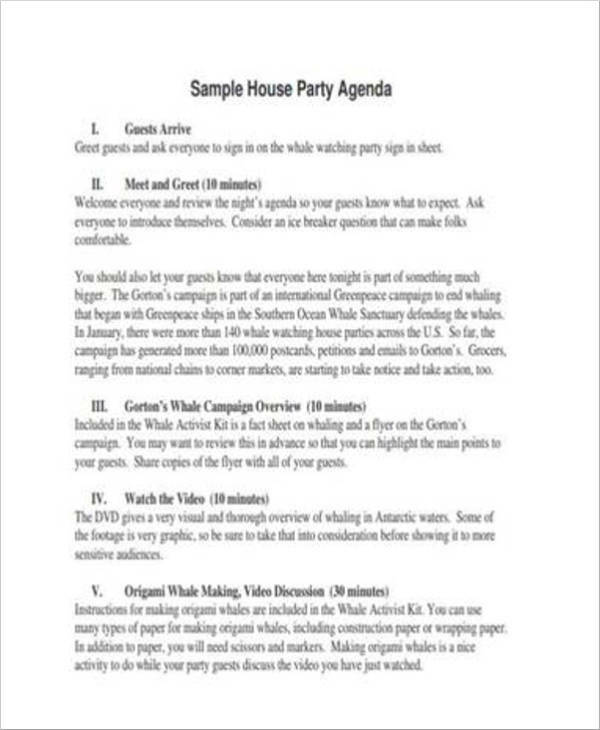 Now that you have a good idea of what you can include in your party agenda outline, you can now get a head start on your very own party agenda. Make sure that what you will be including is going to be a good fit for the party and the theme of the party. Make sure that you also take your time in making your own party agenda to ensure that you do not miss anything important. By following some of the tips we have included in here, you will be able to ensure that your party will stay on track as well as ensure that you are going to be considered as a great party host. 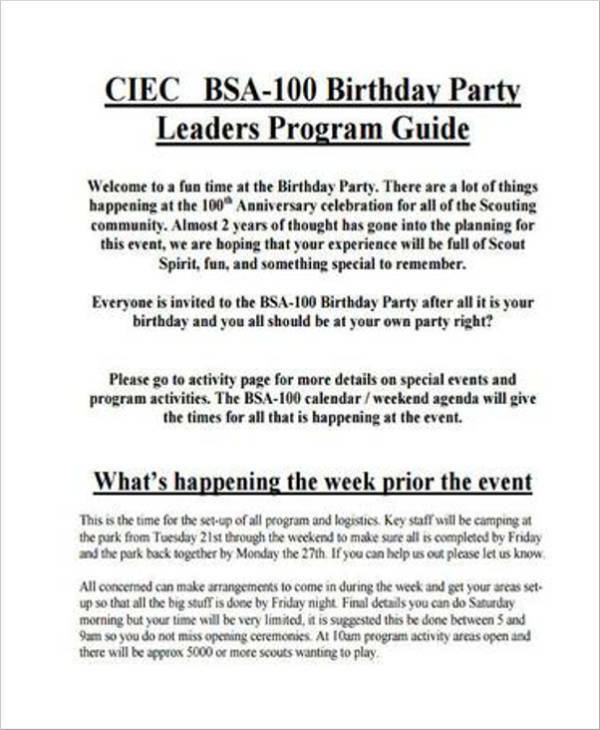 You can find more ideas about how you can come up with party agendas by checking out Event Agenda Samples. Whatever type of party you want to host, you want to make sure that your guests have a great time. Doing all the necessary preparations and inviting the right people, you are sure to make your party a memorable one. 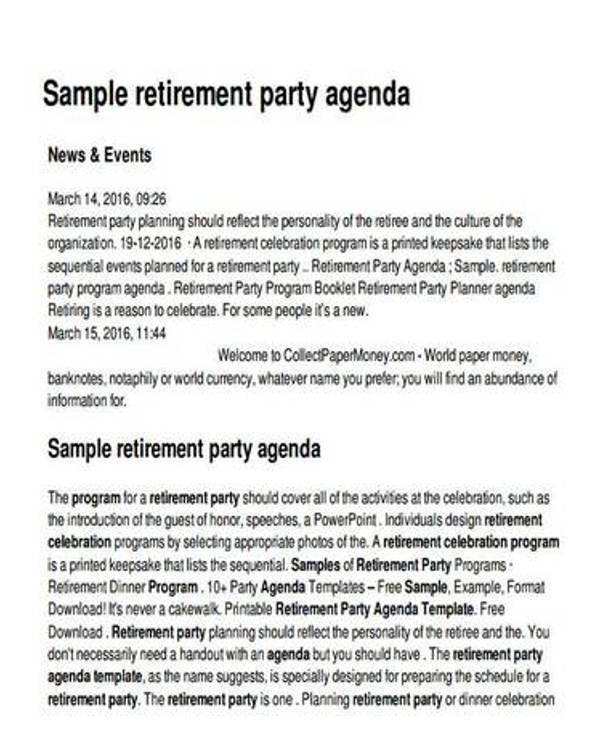 Party free agenda samples are considered to be one of the best ways of successfully hosting parties. Coming up with the right agenda and doing all of the needed preparations for your party can give you the assurance that you and your guests will have all kinds of fun. 1.Make sure you know the type of party you are going to host. You want to make sure that you have a good idea about what will be the type of party you will be holding as this will be your basis for the materials that you might be needed for the party samples & templates. You want to take note of the theme whether it is formal or casual as well as who will be the guests of your party. Send out the invitations. You can do this via invitation letters or you can call the audience. In your invitation letter, make sure that you include the dress code and if they need to bring something for the party. You want to make sure that your house is clean if you are doing it in your house. Do the same if you are hiring a venue for your party. You want to make sure everyone invited will be able to eat. No one should go home hungry. So make sure you have enough food and drinks for everyone. You want to make sure that everything is set at least 30 minutes before the party starts. So make sure that you make the preparations about 2 hours before everything starts. If something happens during the party that is not part of the simple agenda samples, never panic. You do not want to show your guests that something is not going right. Just keep calm and try to recover as soon as you can. Go around and greet everyone around. This makes your guests feel more welcome. Take your time and try to make small talk with everyone. Do not forget to check in on them every now and then. Nobody wants to see you scrambling around trying to get the dishes and washing it while everyone else is still dancing and mingling around. 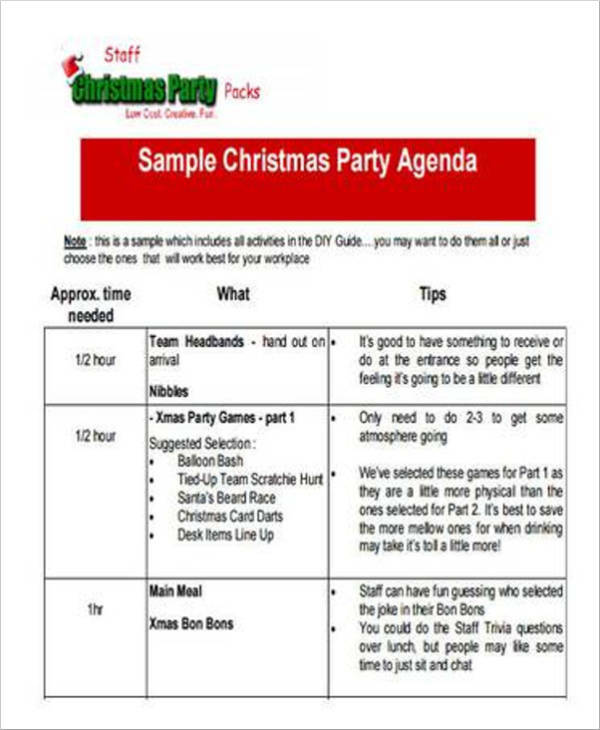 Have a list of party games prepared. Make sure that you also have board games lying around in one area or two areas of the house. As the party goes on, you will see that the vibe of the party will start flowing naturally. You will find that you will start to worry less and less about what you have written on the agenda and you will start to become more and more carefree about your party planning. Go have fun!